Francis McKee: How do we define Public/Private? Hello. I feel a kind of impostor because so many more people here know much more about public art that I do. I thought, ok, I’ll agree to this because I don’t know much about it, so I can find out. Then I thought this morning, this was really dumb because it is a very public way to find out! I should have just bought a book or something – so I apologise in advance. I’m only going to talk for a few minutes now because there are two presentations, one by Suzanne Lacy on her work. This will ground the rest of the conversations for today and tomorrow and is very important for the whole process. Tom is then going to talk about his experience. I am fascinated by this because it is about him as an independent artist and his journey from independent artist to director of Arnolfini and living in the belly of the beast! We were talking earlier about what happens when you get to be in a very large institution like Arnolfini, the almost natural entropy of an institution and how you deal with that, how you remain creative, what works against you, against creativity in that kind of position. I am interested in that for our own reasons. The more local members will know the position that we have been going through at the CCA for the last year. From a position of zero, we have been reconsidering everything very much with the support of both the City and the Arts Council. 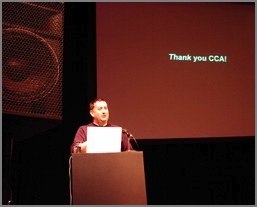 It was incredible to be allowed to reconsider everything very vigorously – why we were here in the first place, what was the actual point of somewhere like the CCA. Tom and I were talking about this a lot today and maybe it is an issue coming out and about. There is a very wide changing landscape at the moment in terms of the art world and particularly in Scotland where art is proliferating, where there is a whole new economy of the art world; different kinds of galleries, different private galleries and public places like Arnolfini, CCA, and ICA. These kinds of institutions are from another age. They deal with cross-art forms, a different public representation of art that is becoming increasingly quaint and strange in various ways. Reconsidering everything leads us to reinvent ourselves in some way because I think there is a niche that we have in the new world, but it is a different niche, and we need to think it through. Something that seemed very important to us and I think what will come up again in the next few days is the relationship of public funding and art. In Glasgow I am very interested in the relationship of public and private in all sorts of aspects. There is a perception – a very basic perception sometimes – that public art happens outside. You put something outside, it is in public, and therefore it is public art. That can be a very basic notion that I have seen presented to me as proposals. Is it art just because it is outside? Is it public art just because it is outside? Why give money to a body like CCA that is meant to be a public institution if it is not considered public? Are public institutions truly public? Where is the ‘public’ and what is the ‘public’ you are dealing with? Is ‘outside’ really public space? There is very little public space outside in the city. It is a vanishing commodity in a large way. Where exactly is ‘private’ and where exactly is ‘public’? Someone said there were camcorder cameras in the toilets of CCA, but they’re fake. I think we have removed them since, but they were there because of people shooting up. If you’re in the toilet and there are cameras there, how private is that? In the same way, if you are on the mobile phone in a CCA toilet, just where are you public and where are you private? It is no longer an easy situation to say, ‘Well, this is public and that is private’. Those things are very, very mixed and very confused. They are in constant flux. You can see it reflected in galleries in Glasgow. We have The Modern Institute, Mary, Mary and Sorcha Dallas Contemporary Art for instance, which are private, essentially commercial galleries – but always with a kind of strange, almost schizophrenic public conscience that you don’t necessarily find in a gallery in London. A gallery in London is about making money, for the artist and for the dealer. Here there is a kind of recognition that there is something valuable in the public space and in the public arena in Scotland that is beyond the market and maybe should be protected, if possible, from the market even by galleries that are there to make money as private, commercial organisations. In this sense these private spaces actually have a public face as well. The Modern Institute is splitting into The Modern Institute and Common Guild. This move was very publicly articulated and also fascinating. It was not necessarily changing the landscape. There is a question – Where exactly is this realm of public and private? What is the function of public art? and a very deep question – Is there still a contract with the public to fund art? I’m not really convinced that is discussed enough. I think the public are unsure of why public art is sometimes funded and why art is funded by public money. I think, for instance, Karl André’s bricks (Lever 1966), was a very obvious sort of tabloid experience. On a deeper level both governments and the public in general aren’t sure why public money should be funding art. It is very seldom discussed because there is a great fear that if you bring it up, everyone might just take the money away and say, ‘No, we don’t believe it’. I think it is a taboo subject in some form, but a fascinating subject. It has not been properly addressed since the Second World War and needs to be readdressed to see how you would justify art in the public realm funded by public money. I think there are very good arguments for why it should be so, but the art world needs to have the courage to make those arguments, to carry out quite a rigorous self-reflection in order to figure out what those arguments are, today, in this divergent landscape. We were talking earlier today about the different issues connected to these presentations. One of the issues was about selection. The one question that keeps coming up in institutions such as CCA or Arnolfini is the curated show in a gallery with the authority to include some and to cut others out. It is interesting to say, ‘What is wrong with selection? Why can’t we select?’ I think everybody selects to a certain extent, but selection is perceived in different ways. There is an authority within a gallery that can make selection overwhelming and actually distorts the reasons why there was a selection in the first place, or distorts the fact that the selection process happens right across the art world, whether in a gallery or beyond the institution. There is also not enough rigour beyond the institution in terms of selection and also in terms of quality. We were talking about quality in public art in relation to aesthetics. How do you say, ‘This is good, and this is bad’ – or Do you say that? ; or Is it about engagement? How do you measure quality in engagement, rather than in an object? If it is all about the nature of the engagement, and the nature of the experience, and the process, is it right to have some kind of measurement ‘This is good’ or ‘This is bad’? Can you go as far as to say, ‘Well, it does not matter whether it is good or bad as long as there is engagement’. There are a whole series of arguments from Claire Bishop to Grant Kester about that. It is an interesting thread that maybe could come up in the next few days. Suzanne mentioned that for artists working in the community, institutions and their authority is not really the issue. The relationship that most exercises people is the relationship between the artist and the community. What is the relationship between the artist and the people in the community, the real world, the real people that they are working with and what happens in the aftermath of that when the artist walks away? Does the credit for the project go with the artist? What is the lingering experience for the people who worked in that project? There seems to be a large spectrum of doubt about that relationship, how valid it was or how you actually examine that relationship. What were the long-term benefits for everyone involved?